Different companies and holdings play the most important role in the social and economic development of any country. Preparing for transactions, getting to know business partners, stock exchange analysis, journalism - these are only a small number of areas which require legal person analysis. 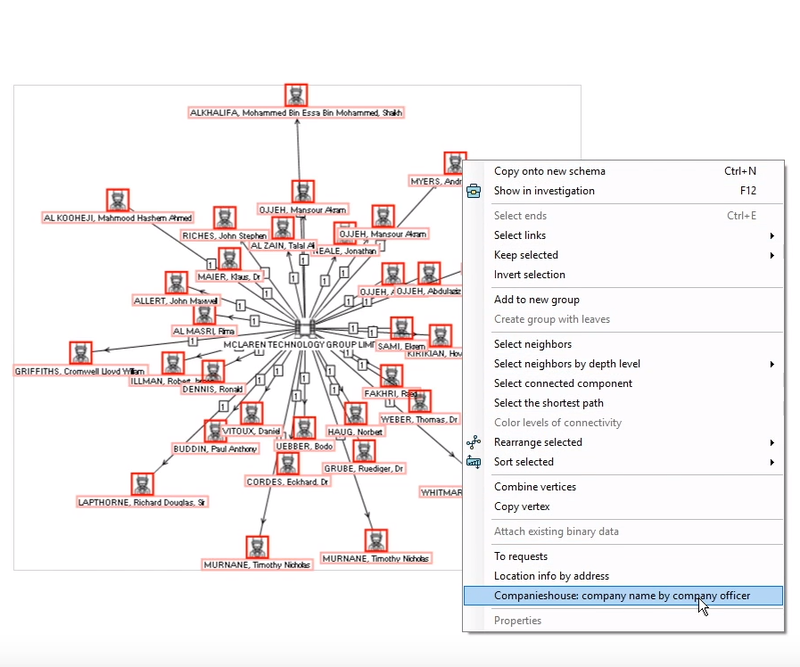 Lampyre system let’s you easily process huge volumes of legal person data. 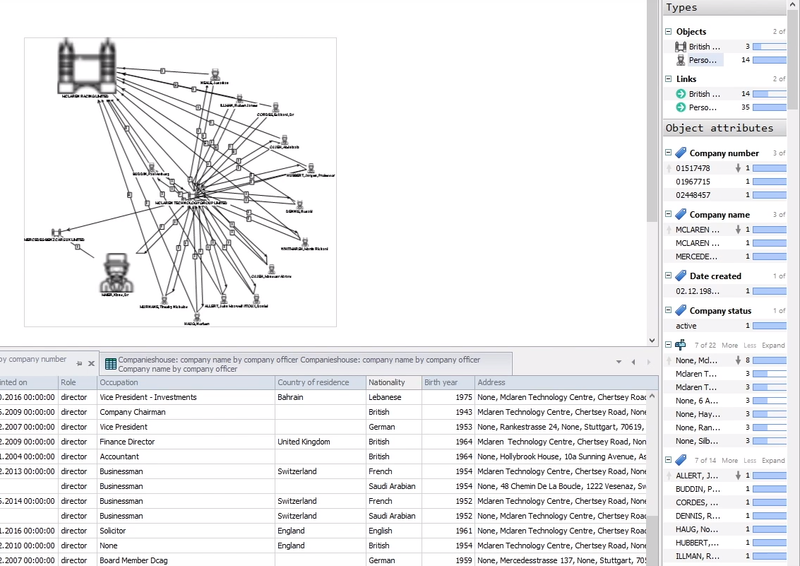 Quick access to any legal person’s info, statistical information in an easy to study and analyse way, all internal connections of a subject company and its founders and management on a clearly readable graph, visualizing data on a map - all this is in favour of tremendously decreasing the volume of the analyst’s time and work. The analyst may use the data he already has or he may download it from different sources. For example, we have created a request to download data from the https://beta.companieshouse.gov.uk/ resource on British legal persons. 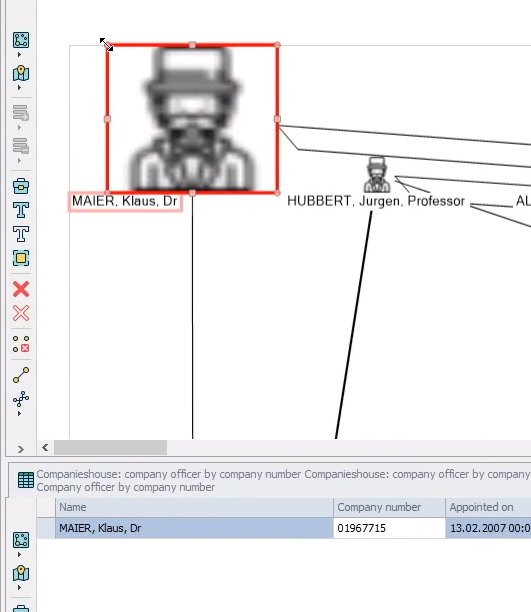 Let’s assume that we have to find how a certain company and a person are connected. You can see how it can be done with the help of Lampyre in this tutorial. In order to start working you have to create an investigation or to open a previously created one. 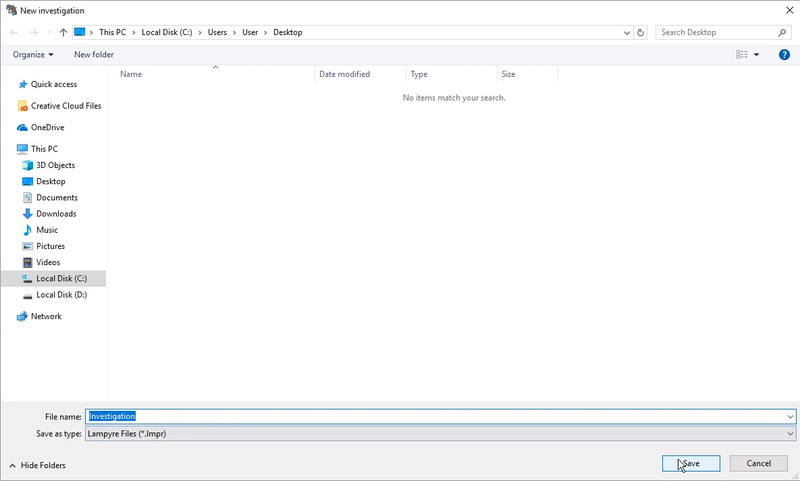 You can do this with start "List of requests" window. Also you can use hot keys (Ctrl+Shift+N) or the "File" main menu. 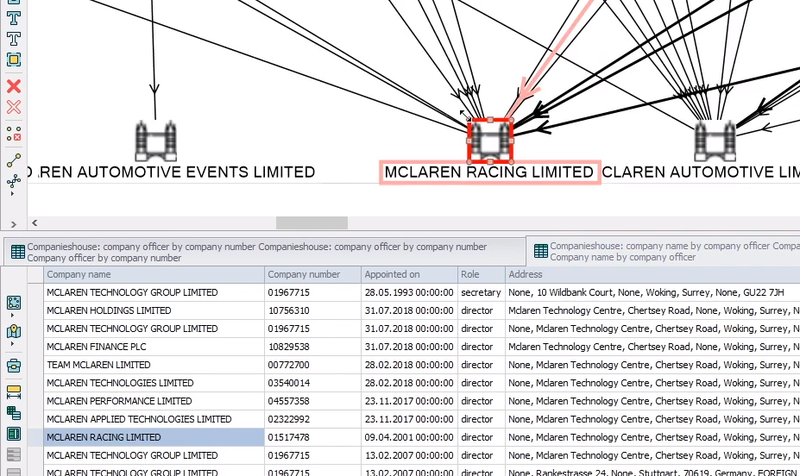 Let’s suppose we’re interested in data on Mclaren Technology Group Limited. 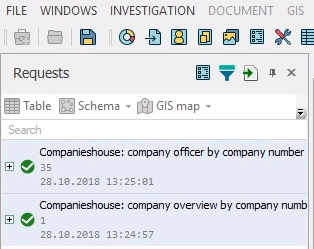 Each object on the https://beta.companieshouse.gov.uk/ resource has a company number assigned, which goes into input parameters for the request. 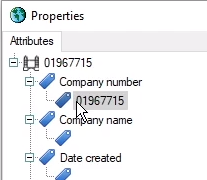 In order to make a request for downloading data let’s add this company to a new schema and input it’s number. For this we select "New Schema" in the "File" main menu. We drag it to our schema. 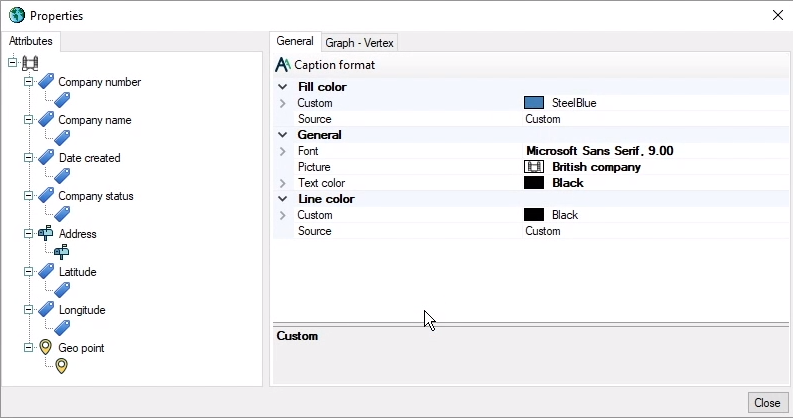 We double click it to open the graph element editor. We add the company number: 01967715. We close the window and now we can proceed to making requests. 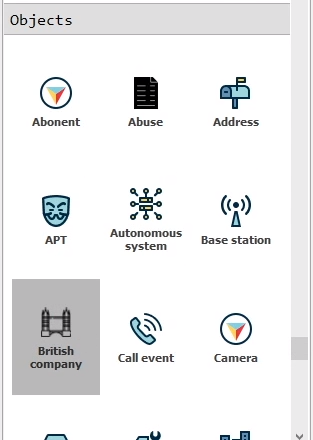 For this we right-click the company icon and request to search for information on the company and then - for the info on private individuals connected to it. You can see the status of your requests in the “Requests” window. As soon as your request is done, the results are automatically uploaded to your schema. 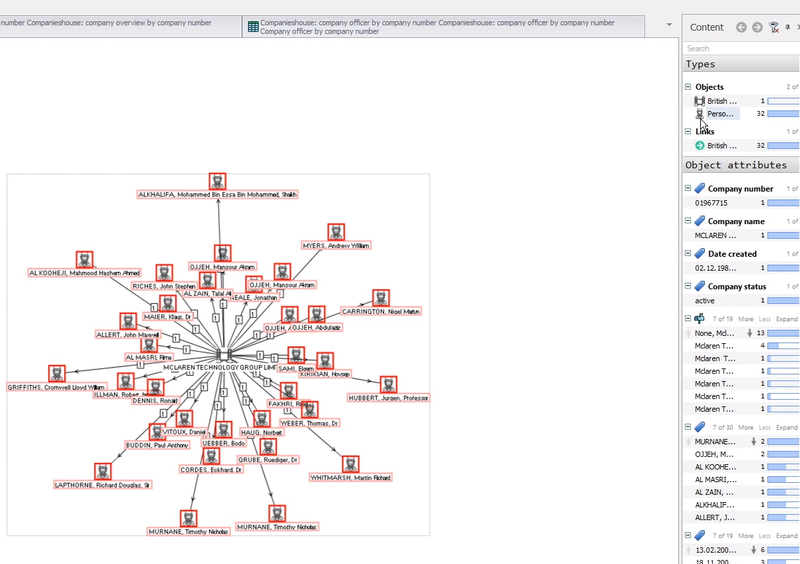 We can view all the data on this company and private individuals, connected with it, in the "Content" window. We can also view this in a table. For this double-click the request in the "Requests" window. 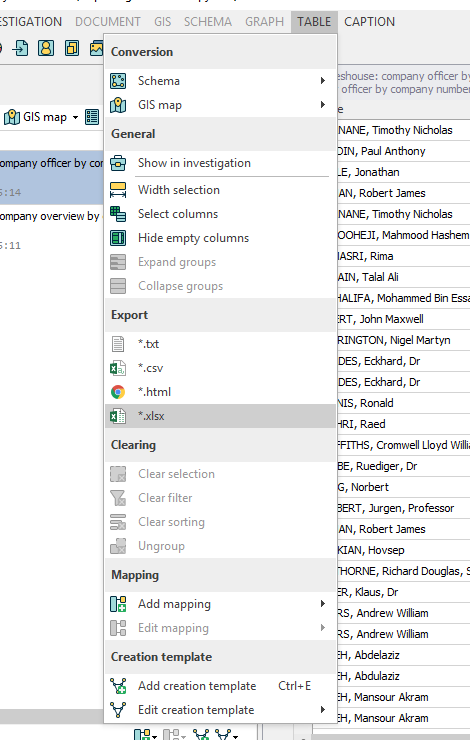 If needed you can export your request results into a file of preferred format. To do this you click "Table" and choose a format to export into. 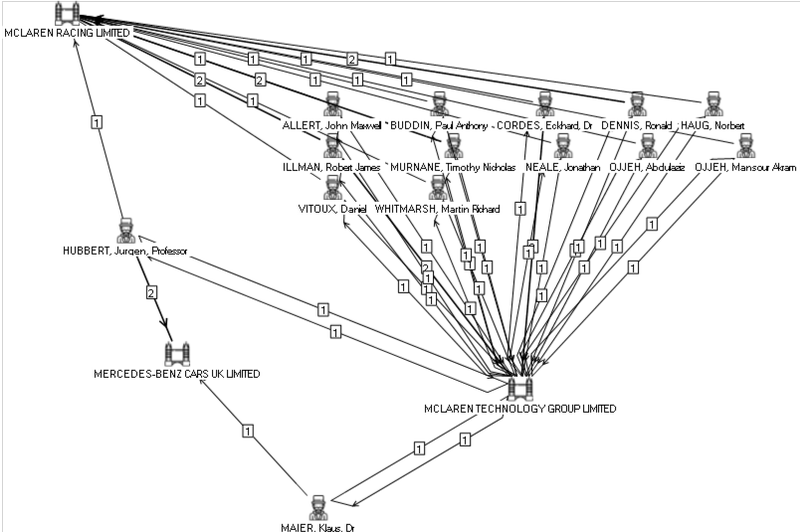 Now let’s get data on legal persons which are connected with the already found private individuals. This will be level 2 search depth. We select all private individuals in the "Content" window. 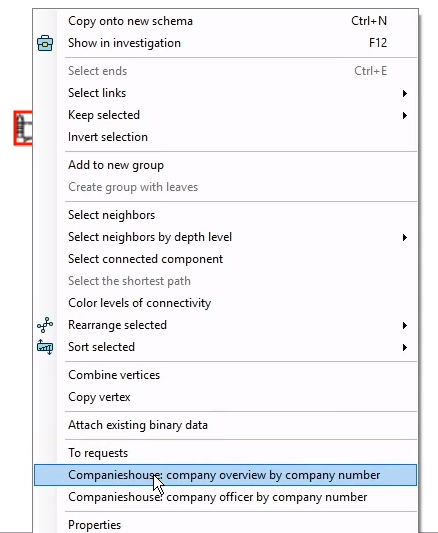 And make a request to find all connected companies. Again, we can follow the request status changes in the "Requests" window. 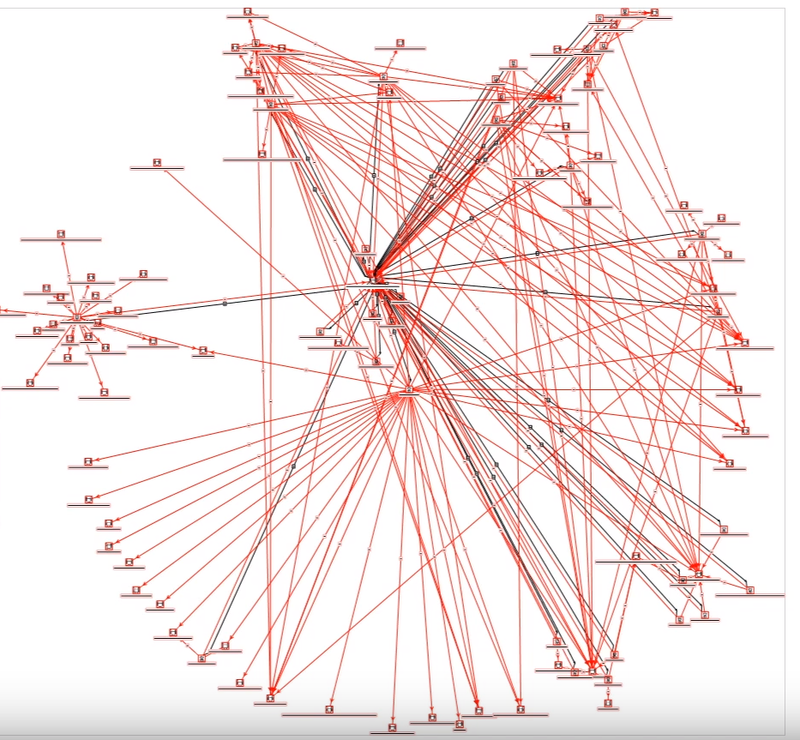 We can change the graph layout for a better perception. 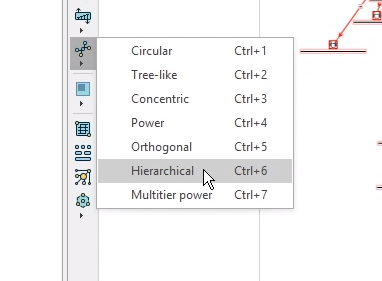 By clicking the hierarchical layout button in the express panel. 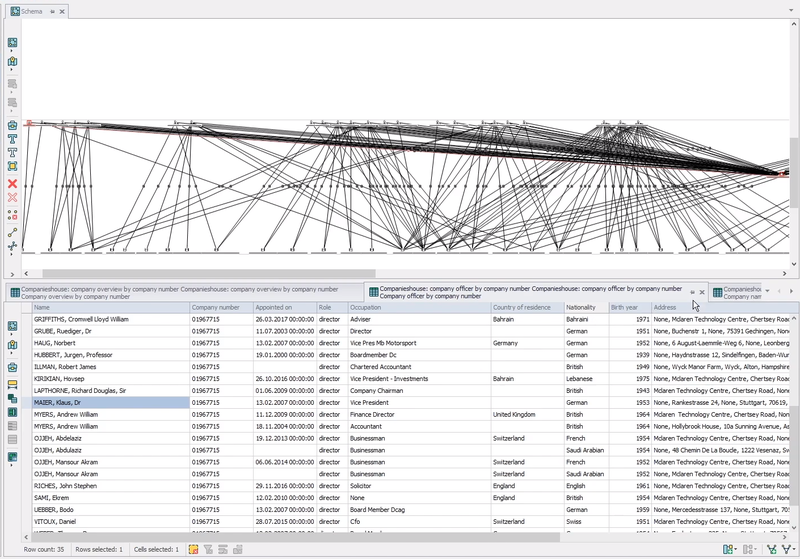 We get the data in a structural way. 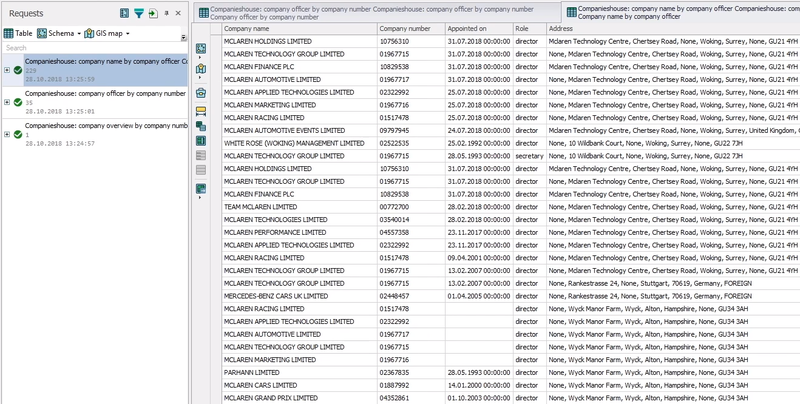 Also by double clicking the request we get data for the newly downloaded results on the companies of the 2nd level. 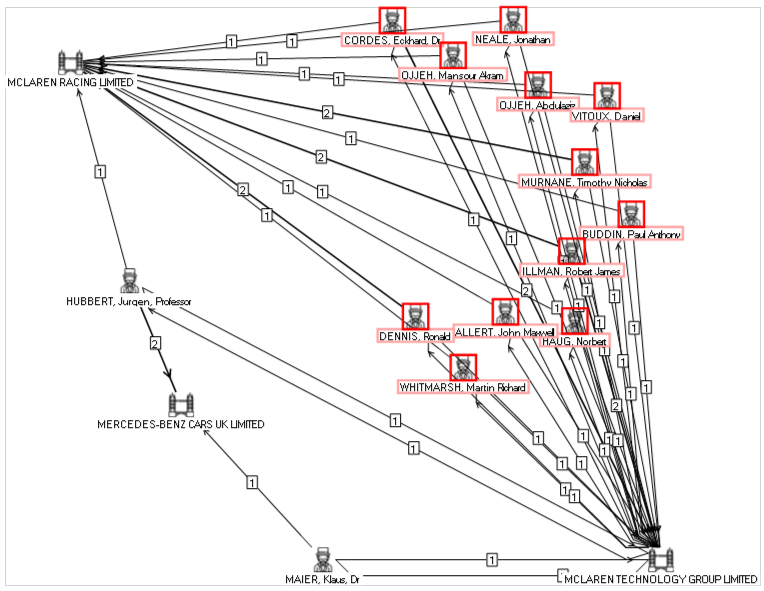 Now let’s find out how a particular company and a private individual are connected. This may not be a direct link but - as it often is - through someone or something else. Finding this connection without any tools is real difficult most of the times but you need to perform such tasks quite often. Here you can see how to solve such problem quickly with the help of Lampyre tools. Let’s select 2 vertices between which we need to find a connection. 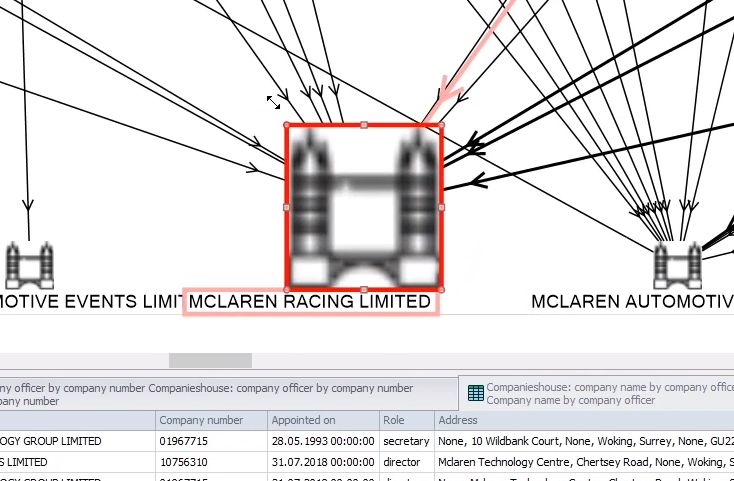 We need to find the shortest link between the vertices of the "British company" and a "person in a British company" types with certain IDs. Finding these 2 vertices on the schema. 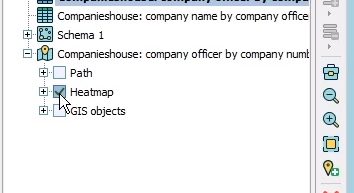 To do this let’s use the cross-module feature and intersect the data on the schema with the data in our table. To make it comfortable let’s place the table under the schema. We choose our table in the tabs here and drag it down. Pop-up menu appears which let’s you to choose where to place your tab. We choose placing it under the schema. 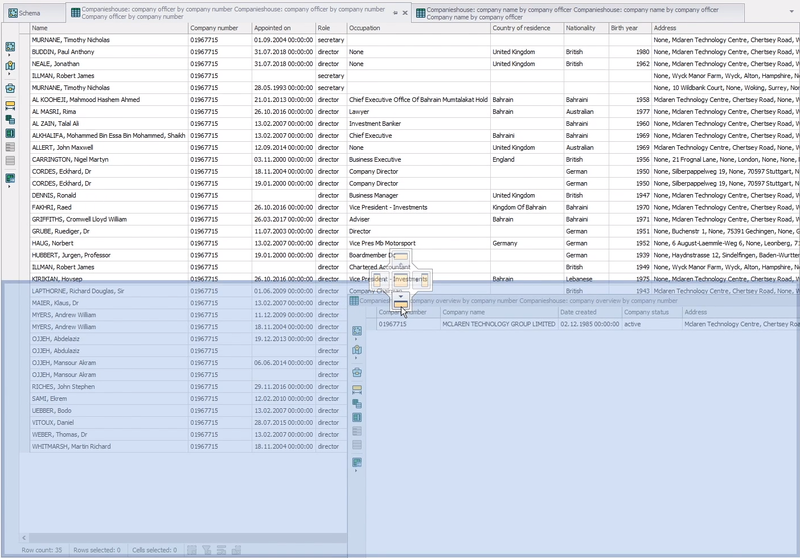 Now when we select someting in our table we see that the same is highlighted in our schema too. So we select the needed vertex and enlarge its icon to make it more noticeable. We need to pull any corner of the icon to do this. Now we do the same for the 2nd vertex - a person in a British company. Hold Ctrl on your keyboards and select both vertices. 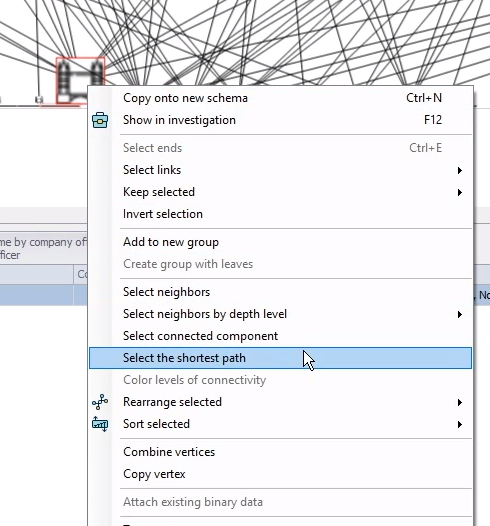 Right-click any of the selected vertices to open the context menu In the drop-down list select to search for the shortest path. We can transfer it to a new schema and change the layout for a better perception. To do this we press Ctrl+N. 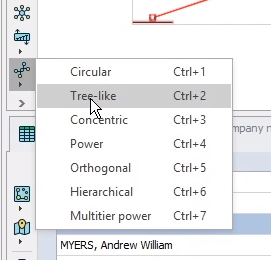 So in our new tab holding Ctrl button we select those 2 vertices between which we needed to find a connection and then change the layout into the tree-like upon the selected items. Now we select the group of individuals inbetween these companies. We right-click this selected group and sort it by name. 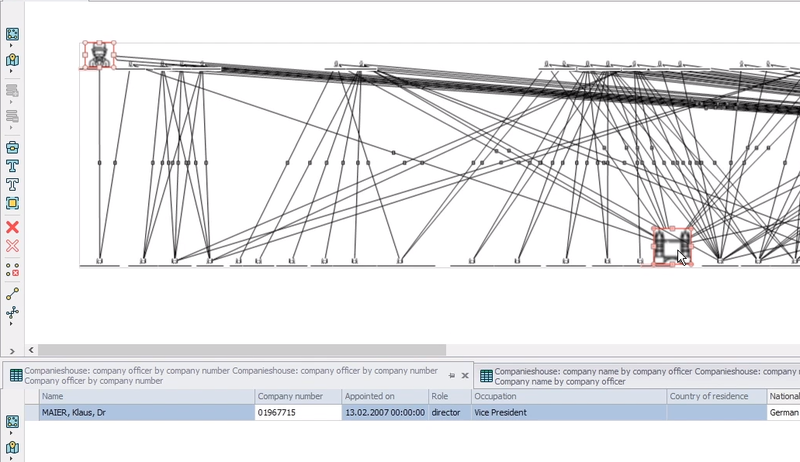 Now we see the connection between our specified vertices along with all available statistical information in the contents window to the right. 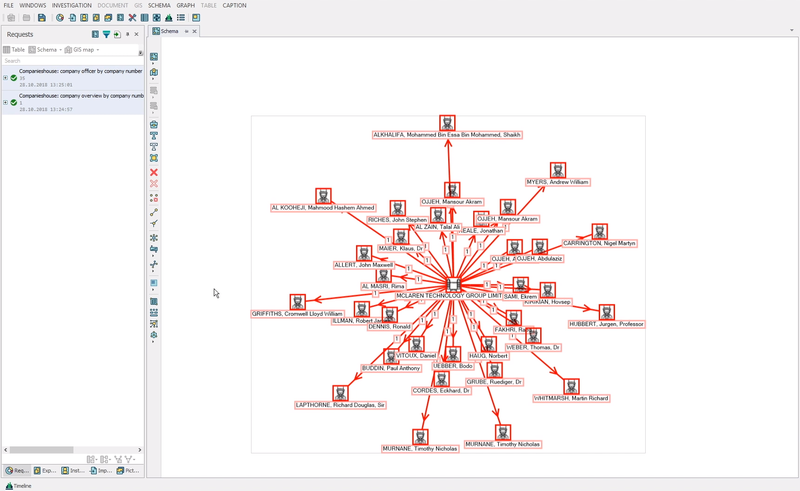 Also if you need to analyse data on a holding you can use a gis-map. 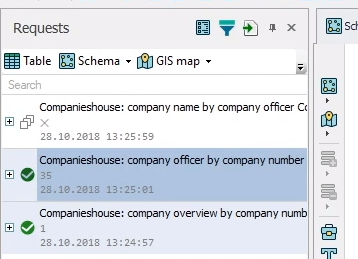 For example, it wil be easy to build a map of all the company's offices if you have addresses or coordinates in the results of your search requests. 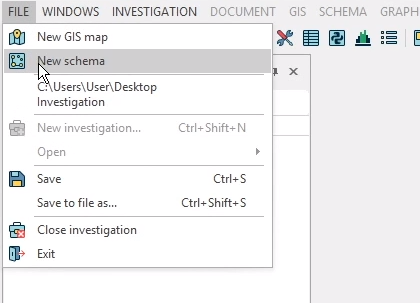 Select a request in the "Requests" window and click the "GIS map" button. 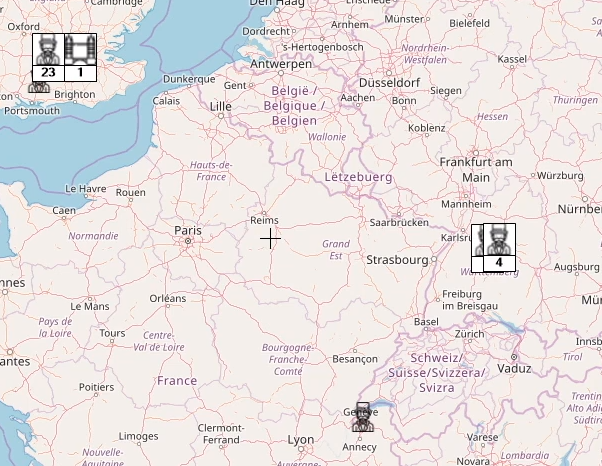 By default icons of the specified objects are visualized on a map. Let's switch into heat map. 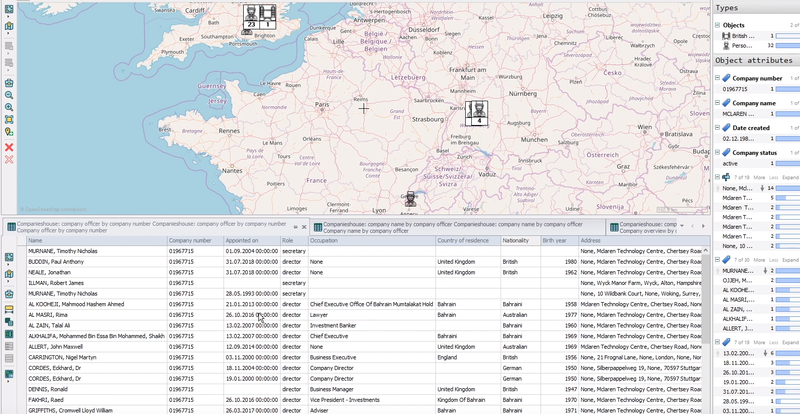 To do this we open the Explorer window and view the options of visualization on map. 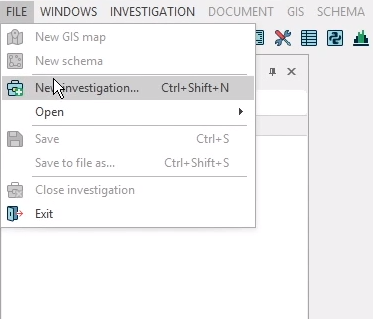 We tick "Heatmap" and untick "Gis objects". What we get is a heatmap of the holding’s offices by their number. 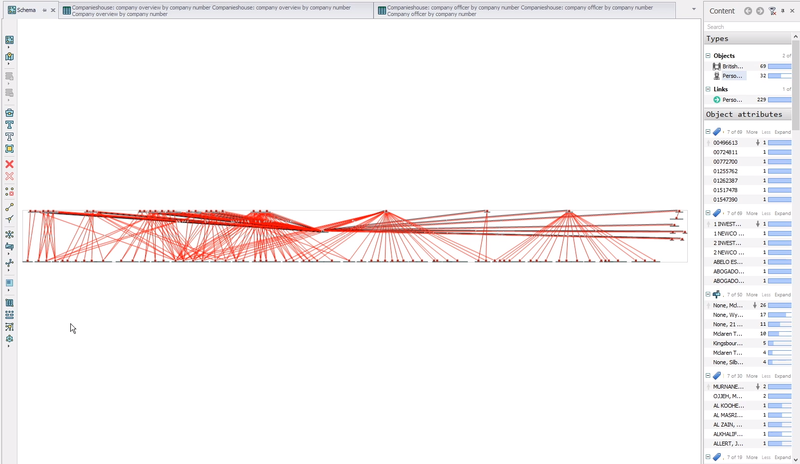 When working with map you can use the cross-module feature and intersect the same data visualized in different ways. 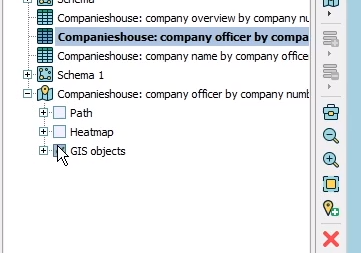 For example at the same time you can use a table and a gis map. To make it comfortable let’s place the table under the map. We choose our table in the tabs here and drag it down. Pop-up menu appears which let’s you to choose where to place your tab. We choose placing it under the map. 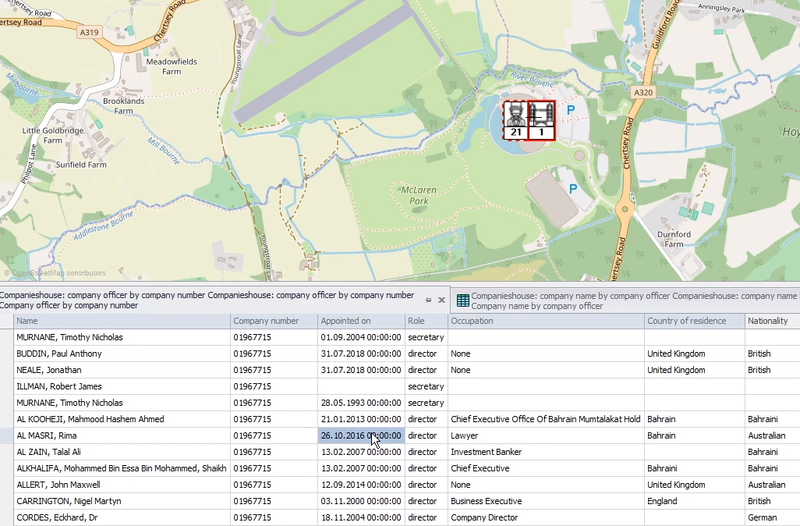 If you select certain rows in your table the same data is highlighted in your map. 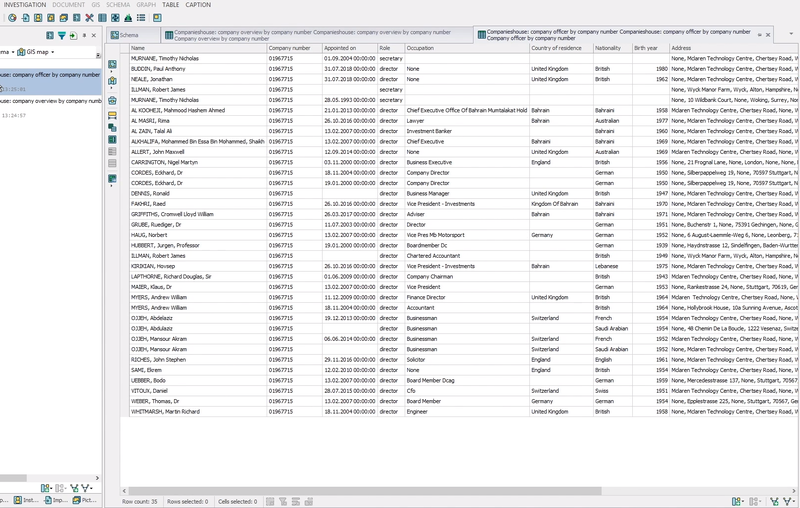 The "Contents" window data also changes and rearranges depending on the values selected. 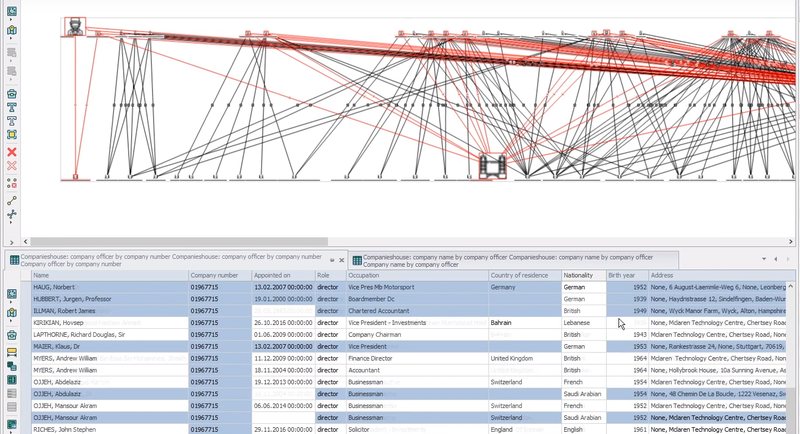 The same way we can find a connection between any other objects and then visualize the results on a map for a more comfortable analysis.